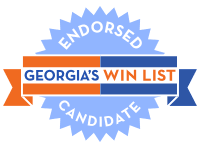 Georgia’s WIN List proudly endorses Jen Slipakoff for House District 36 which includes the city of Kennesaw and runs along the Cobb-Paulding county line. Jen is running against the wife of Earl Ehrhart, the former incumbent who served 30 years with minimal opposition. He was known as the biggest bully in the Georgia legislature and sponsored many controversial bills. Most political pundits predicted Jen was offering herself as a “sacrificial lamb” when she first announced plans to challenge Earl Ehrhart. Jen, a graduate of the 2017 WIN Leadership Academy class, quickly proved herself a serious candidate when she reported $65,000 in contributions for her first disclosure. Earl stunned the press when he announced his plans for retirement on the first day of qualifying. Jen has now raised more than $100,000 and her support continues to grow. She has a devoted core of volunteers who have already knocked on thousands of doors to connect with voters. A University of Florida graduate, Jen has lived in Georgia since 1999 with her husband and two children. She has served on the board of her synagogue, as co-president for PFLAG Atlanta, and on the Atlanta Steering Committee for the Human Rights Campaign. She has been a vocal ally and fierce advocate for the LGBTQ community and was recently honored for her advocacy efforts by Georgia Equality. EDUCATION – Jen is dedicated to ensuring schools are properly funded and teachers are properly compensated. She is also dedicated to equalizing the disparity found not only in Cobb County schools but also school systems across the state. HEALTHCARE – Jen strongly supports the expansion of Medicaid in Georgia. Over half a million Georgians have felt the impact and suffered the consequences of inadequate Medicaid provisions. TRANSPORTATION – Jen pledges to fight to reduce congestion on our roads by offering incentives to businesses which promote alternative work arrangements and explore investments in a bus rapid transit system to connect West Cobb with regional transportation hubs. EQUALITY – Jen is committed to passing Georgia’s first anti-discrimination law to ensure equality and civil liberties for Georgia’s LGBTQ community. Jen also pledges to fight for equal pay for equal work and equal access to employment, housing, healthcare, and education. GUN SENSE – As a gun owner, Jen believes families have a right to responsibly protect themselves but is strongly against the use of military-style weapons for personal safety and the presence of guns on university campuses. Jen will fight for common sense gun legislation. Running against the longest sitting GOP representative and a 30-year incumbent is no easy feat, but women like Jen are fearless and determined. They do not back down when things get tough. Jen may not be officially elected yet, but she’s already changed the face of power in Georgia by forcing her opponent into retirement. Imagine what she’ll accomplish once she’s elected! With your donation, you can help flip a seat that’s been under GOP control for 30 years and put Jen Slipakoff in office. Will you join us today with your generous contribution?